On Tuesday night, June 7, Saint Augustine School graduates, school staff, and their families had a wonderful evening at the Fiesta with great food and music. Everyone danced the night away. A group of Weehawken High School students who are participating in a unique college readiness research program, AP Capstone, shared highlights of their original research at the June 7 meeting of The New Jersey State Board of Education in Trenton. Only 11 New Jersey high schools have been given the nod by the College Board to offer AP Capstone. 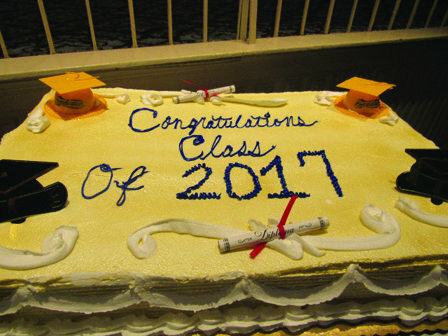 Weehawken High School is the only high school in Hudson County to offer the prestigious diploma program, noted Weehawken Director of Academic Affairs Francesca Amato. Prestige aside, “Research has demonstrated that students who earn college credit by taking AP classes benefit higher rates of college completion in four years and from drastically reduced tuition costs,” she said. The AP Capstone program is designed to cultivate inquiry in young scholars who engage in independent research and collaborative scholarship – skills increasingly and aggressively sought by top colleges and universities. Students who successfully complete the two-course sequence of AP Seminar and AP Research receive the AP Capstone Diploma. The 16 Weehawken upperclassmen and their teacher Brian Fischer were in Trenton to present their AP Seminar research projects to attentive state board members on the invitation of Acting New Jersey Commissioner of Education, Kimberley Harrington, who had visited the Weehawken School District in March. 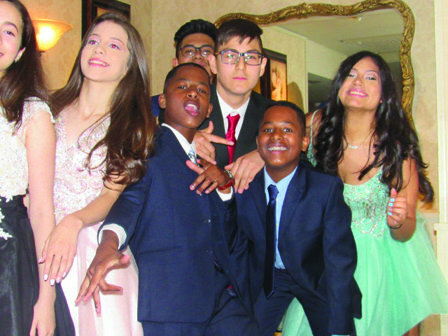 The program is in its first year at Weehawken High School, launched in September 2016 after Superintendent of Schools Robert R. Zywicki initiated the program earlier that year. AP Capstone is one component in a rapid roll-out of innovations for the PK-12 district by Zywicki, who was appointed superintendent in November 2015. Mayor Richard Turner and The Township Council, along with the Hudson County Office on Aging, would like to invite the Weehawken Senior Citizens for the Annual Boat Ride on the Spirit of New Jersey on Wednesday July 19. Call the Senior Center at (201) 319-6060 to register or for further information. The township’s school system stands to lose $216,977 in school aid over 2017-2018 if the school-funding compromise struck by Democratic legislative leaders gets enacted. Last year the district received 2,722,708 in state school funding. The proposed formula wouldn’t change aid for the coming year for 74 districts – but statewide would mean aid increases of 10 percent or more for 70 districts, and aid reductions of 5 percent or more for 50 districts. Those changes reflect proposed differences from what districts were promised in early March, when the state Department of Education sent aid notices shortly after Christie proposed the budget in a speech to the Legislature. Districts have adopted budgets based on those figures. The changes would require the agreement of Gov. Chris Christie, who had asked lawmakers to come up with a school-funding fix by early June but isn’t yet convinced of the merits of the current plan. Senate President Stephen Sweeney, D-Gloucester, said school funding is one of the most important things the Legislature needs to focus on. Step two, presuming Democratic gubernatorial nominee Phil Murphy wins in November, is a hike in income taxes for the rich. “Next year, January, and we will do it when the new governor is sworn in, the day the new governor is sworn in, we will put up a millionaires tax. It will generate a minimum of $600 million” and bring every district in the state over 70 percent of full formula funding, Sweeney said. A diverse and eclectic program of Wednesday evening summer concerts returns to the Weehawken waterfront as the Hudson Riverfront Performing Arts Center, Inc. (HRPAC) presents Summer Concerts on the Hudson 2017. The free series is co-sponsored by the Hudson Reporter. This series of concerts starts on Wednesday, June 28 at 7 p.m. and will feature top artists from many different musical genres, including Motown, Latin, Jazz, Bluegrass, and Flamenco. On June 28, the band Shadows of the ’60s will pay tribute to The Four Tops, one of Motown’s greatest groups. The concerts are family friendly. Concertgoers are requested to bring a lawn chair or blanket and encouraged to pack a picnic and enjoy the pastoral setting of Lincoln Harbor Park. All performances take place at Lincoln Harbor Park and begin at 7 p.m. Rain dates, if necessary, will occur the following night after each scheduled performance. For information, directions, and late breaking concert news and updates, please check the HRPAC website (www.hrpac.org) or call the concert info line at (201)716-4540. Learn how to become a CASA (Court Appointed Special Advocate) volunteer and help foster children find safe and permanent homes. 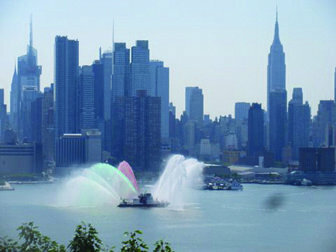 The next information session will be at Little City Books at 100 Bloomfield St., Hoboken, on Tuesday, June 27 at 7 p.m.